In Iran, several pesticides are generally used to enhance the agricultural yield. Although the exposure to various pesticides is possible for all people, the exposure to pesticides is one of the important occupational risks between farmers. Pesticides have critical effects on individual health because they influence the immune system, the endocrine system, and the nervous system. The World Health Organization and the United Nations Environmental program predicted that one to five million cases of pesticide poisoning happens between farmers every year. The exposure to pesticides may accidentally and inevitably occur during the use of them or can happen through the residues of pesticide in water, soil, and plants. Studies show that only in America each year more than 2 billion pounds of pesticides used in various sectors such as the agricultural sector. Because of the high consumption, the exposure to pesticides has increased, and as a result, the complications and adverse effects of pesticides on farmers' health have increased. However, in developing countries compared to developed countries, owing to increasing the consumption and the availability of a variety of pesticides, the amount of poisoning in farmers are high. In fact, this organization is the advocate of the pro-ban policy and restrict the use of pesticides Class I and the use of pesticides that are less damaging to the health of their employees. However, because of the high volume of pesticides used, the human exposure to these pesticides is almost inevitable. In addition, studies show that farmers on how to protect themselves against work-related risk factors such as pesticides do not have enough information or are not committed to the protection measures; so that, in a study done in 2011 among farmers of South Khorasan province, the results showed that the awareness is very weak about of safety precautions and the use of personal protection. In a study done in Ohio, Minnesota, and Inova on 1011 farmers, the results showed that farmers' awareness toward the seriousness of the use of pesticides was very low and had the low-risk perception from dangerous of agricultural pesticides. Studies associated with the knowledge, attitude, and behavior on the use of pesticides have been done in some countries., They revealed that there are still many farmers who behave risky, and there are farmers who do not use the personal protective equipment throughout spraying. According to the above-mentioned issues and problems, few studies have been done on this topic in Iran. Therefore, this study was conducted to evaluate the knowledge, attitude, and practice of pesticides use among farmers in Kabudrahang County, Hamadan Province, Iran. This cross-sectional study was conducted in Kabudrahang County, located in the west of Iran. Data were collected from farmer's sprayer, during April to July 2016. Primary data regarding farmers were taken from health system through Farmers Health Program because of the recognition of the farmer's sprayer. Researchers referred to health houses and after contacting with farmers were asked to participate in this study. The questioner, after explaining the goals of the study and obtaining the informed consent of the subjects for the participation in the study, completed the questionnaire for the farmers who were willing to participate in the study through an individual interview. Inclusion criteria included the farmers themselves are responsible for spraying, and they do not employ the sprayer worker and the farmers who have at least one years of work experience and certainly use the pesticides in their agricultural land. Exclusion criteria included farmers who did not consent to participate in the study. There has not been a similar study in the country so far to assess the knowledge and attitude and practice of farmers in the use of pesticides, the proportion of people who do not have proper knowledge, attitude, and practice about pesticides (P = 0.05) was considered. The confidence level was 95% and the accuracy was 0.06. Therefore, the sample size was calculated, 267 people. Data were collected using convenience sampling through interviews with the farmers who had spryer during period spraying and lived in one of the villages of Kabudrahang County. Data collection instrument was a questionnaire that included three sections. The first section covered demographic information with seven questions. The second part included seven questions about pesticides and the use of it. Questions were approved with concrete and standard pesticides sources.,, A third part of the questionnaire contained the questions about Knowledge, Attitude, Practice (KAP) constructs. These constructs included knowledge with six multiple-choice questions and two “Yes/No” questions scoring from zero to eight; the higher score is indicative of the better knowledge of farmers on pesticide use. Attitude with 12-Likert Scale questions (categorized from agreeing to disagree) scoring from 12 to 36. Furthermore, practice construct included 18-Likert Scale questions (categorized from always to never) scoring from 15 to 60. Questions evaluated the farmer's performance and provision of safe actions to prevent poisoning by pesticides. Practice questions were self-reported by participants, and the higher score achieved is indicative of the superior performance. To measure the validity of questionnaire, content validity ratio (CVR) and content validity index (CVI) indicators were used. Therefore, the questionnaire was given to ten health promotion and health education and occupational health professionals that the necessity of questions for calculating the CVR was evaluated that questions achieved 75% of the score. For CVI, the criterion of relevance, simplicity, and transparency were examined, that scores were more than 79%, as a result, the questionnaire has good content validity. In addition, face validity of the questionnaire was testified by ten farmers. Its reliability was tested by a pilot study on 30 farmer's sprayer, and Cronbach's alpha coefficient was recorded 0.70, 0.71, and 0.79 for knowledge, attitude, and practice constructs, respectively. Among 267 farmers, a number of 262 questionnaires were filled out by interview (response rate: 98%). Totally, 2% missing participation was due to lack of consent to participate in the study. Data were recorded using SPSS version 21.0 (SPSS Inc., Chicago, Illinois) and were analyzed using frequency analysis and Pearson correlation test with 5% confidential level. This study was accepted by Ethical Committee of Hamadan University of Medical Sciences (reference number: IR.UMSHA.REC.1395.162). The results were acquired from completed questionnaires submitted by 262 male. The age of participants ranged from 16 to 95 years, with a mean age of 42.47 ± 13.16 years. The most number of farmers were in the 21–40 years old. Regarding the educational status, 25.2% of participants had completed primary school and only 6.1% had completed some college-level curriculum or more (post-high school). Approximately, 22.6% of farmers had eating and drinking habits during using pesticide. Burning eyes and dizziness were greater symptoms of poisoning with pesticides. The details of participants' characteristics are shown in [Table 1]. [Table 2] shows the knowledge of the farmers about the ways of pesticide entrance into the body, storage of pesticides, the way of destroying pesticide, protect themselves against pesticides, the way to recognize the dangerous pesticides, attention to buy the pesticides, and how to use pesticides. Out of 262 farmers, 195 (74.4%) knew the ways that pesticides enter the body. It was also found that most of the farmers knew how they can storage pesticides and protect themselves against pesticides 231 (88.2%) and 189 (72.1%), respectively. [Table 2] also shows 100 (38.2%) of farmers knew how to use pesticides correctly but, in overall, most of them did not have proper knowledge. A total of 236 (90%) of farmers stated that use of pesticides is required for pest control. In term of body resistance to pesticides, a total of 77 (29.4%) farmers agreed that their body will be resistant to pesticides if they have good health status, whereas 149 (56.9%) were against the statement. Most of the farmers had proper attitudes toward the use of personal protective equipment. Therefore, 79% of farmers agreed that personal protective equipment is required in farming either at the time of spraying or mixing. However, 37.4% of them reported that the use of personal protective equipment is not easy. 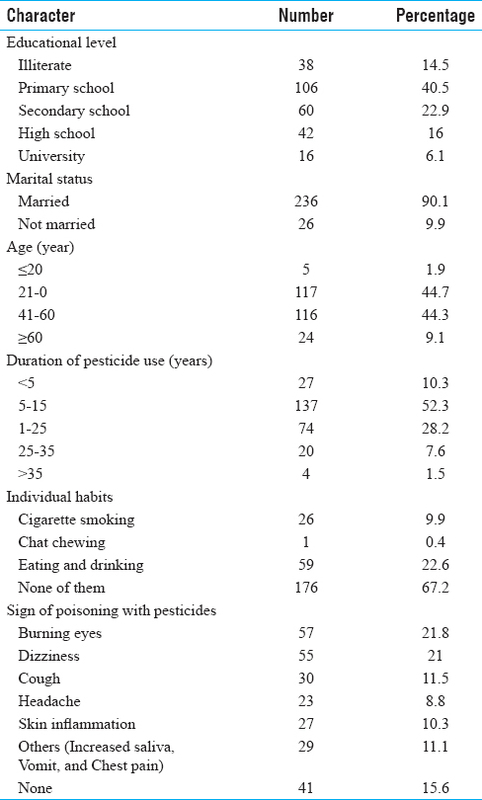 The farmers knew that taking bath and avoidance of eating and drinking can protect them against the pesticide poisoning [see [Table 3]. More than 50% of farmers used mask, hat, and shirt with long sleeves suitably and correctly during pesticides exposure. However, less than 50% of them avoid drinking, eating, and smoking. Less than half of farmers used glasses, long gloves, and boots [see [Table 4]. The farmers' knowledge and attitude about the use of personal protective equipment were in line with their practice. Correspondingly, the farmers' practice toward the use of personal protective equipment correlated with their knowledge and attitude (P < 0.001) see [Table 5]. The present study was done on farmers of Kaboudarahang County located in the west of Iran. Despite of a high population of farmers in Iran, the present study is the first study that was conducted to evaluate the knowledge, attitude, and practice of pesticides use. Farmers' cooperation in the above questionnaire completion was high that indicates the interest of farmers in investigating their health. However, it may have been due to lack of attention to farmers over the years. About half of the respondent farmers had high school education level or more that it was indicative of high education level between farmers of this region. These results are in contrast to the results of several developing countries.,,, The observed difference can reflect the unemployment crisis in the area studied. In addition, nearly half of the studied farmers were in the age group of 21–40 years old, considering the high level of education among farmers, it is shown that they, especially young people, have to be employed in the agricultural sector due to lack of job opportunities. Approximately, 52% of farmers who have used the pesticides were between 5–15 years old that it indicates the most of farmers studied are young and this reveals that the farmers use the pesticides from the starting of their agricultural activity. The knowledge of farmers is relatively certain toward the routes of pesticides entry to the body, to maintain and storage of the pesticides, and how to protect themselves against pesticides. The lowest amount of knowledge of farmers was about the disposal of pesticide containers after usage; that these levels of awareness (31.7%) can create a dangerous situation for farmers if they exposed to residues of pesticides in the plants, soil, and dust particles after spraying as well as used water flow for irrigation of agricultural grounds. The release of empty containers of pesticides in agricultural land and washing, and reuse of them has also been reported as the main problems of pesticide disposal in a number of studies.,, In addition, the burning of empty containers of pesticides should not be used as a disposal management technique for pesticide containers. In most developing countries, the pesticide containers are also used as storage containers for other materials, including fuels. Respondent farmers were questioned about pesticide-related toxicity symptoms; most farmers reported eyes irritation, headache, dizziness, coughing, and skin inflammation. Many of these symptoms are considered as common manifestations of acetylcholine esterase inhibition. Given the symptoms reported by farmers, these findings need to be prevented, intervened, and supported by the Ministry of Health and other nongovernmental organizations. Similar findings have been reported in many countries., In this study, most of the farmers believed that the bathing is essential after using pesticides, in addition to changing the clothes to reduce the poisoning caused by the use of pesticides. In practice, nearly 80% of the farmers used from bathing after spraying in addition to changing clothes. More than half of the farmers believed that the use of personal protective equipment during the pesticides use was not hard and, in practice, nearly 50% of farmers used hats, gloves, masks and rubber boots. However, the percentage of spray-applied spectacles was low, which could be because of the high level of eyes irritation among the farmers in comparison with other symptoms. In fact, the farmers used the personal protective clothes that have the slightest interference with their work. For this reason, the simultaneous use of personal protection and spraying equipment has not been hard in the farmers' opinions. The study found that less than 50% of farmers used the pesticide formulations during the pesticides use and they often used the pesticide sellers' advice or their skill and experience; in addition, only 42% of farmers paid attention to the advice of the Jihad Agriculture Department personnel when they buy the pesticides and often used the advice of sellers. Given the high percentage of improper use of pesticides and the high level of obtaining the information by pesticide sellers and the impossibility of disconnecting farmers and pesticide sellers, it can be said that the information of pesticide sellers needs to be reviewed and should be trained. Approximately, 80% of the studied farmers believed that smoking would increase the entry of pesticides into the body, and about 75% of farmers never smoked during spraying or did not smoke often during spraying. In addition, the habit of smoking was observed among only 10% of farmers during spraying. In the present study, there was a significant relationship between knowledge and attitudes of farmers, as well as knowledge of farmers and the use of personal protective equipment as well as farmers' attitudes and the use of personal protective equipment. The results of this study are very similar to the results of the Norkaew et al., study. The significant relationship found reflects the positive effects of farmers' knowledge and attitudes on the use of personal protective equipment. The results of the Derafshi study among Turkish farmers showed the reverse results compared to this study. In the Derafshi study, the ineffectiveness of farmers' attitudes toward their use of personal protective equipment was reported to be the reason for the lack of significant relationship between knowledge and attitude, and between the knowledge and use of personal protective equipment, and also the negative relationship between attitude and use of personal protective equipment. One of the strengths of this study was to investigate farmers' knowledge and attitudes for the first time in Iran and also in Kabudarahang County. Additionally, the response rate has been relatively high. One of the weaknesses of this study is that the study was conducted on a limited number of farmers in a region of the west of Iran. Therefore, it may be difficult to generalize the results of this study to other populations, such as gardeners or farmers in areas with different climatic conditions and different uses of pesticides. Similarly, the symptoms of poisoning mentioned by farmers in a particular period by the questioner have been completed and may be influenced by factors, except the exposure to pesticides. The present study showed that most of the farmers in the study area did not use their knowledge to use pesticides safely. According to findings, we need to the Ministry of Agriculture interventions in collaboration with the Ministry of Health to hold a training program to educate the farmers on the importance of pesticide management and its effects on humans and the environment. Training should also include retailers of pesticides that provide informal training for farmers. Clearly, raising the farmers' perceptions about the importance of individual protection measures and increasing farmers' inclination should be prioritized in future education programs. This is a vital point to be considered by health professionals during the designing and producing the appropriate educational materials. The Research and Technology Deputy of Hamadan University of Medical Sciences have approved this project. Hamadan University of Medical Sciences supported this work [reference number: 9508184898]. Hashemi SM, Hosseini SM, Hashemi MK. Farmers' perceptions of safe use of pesticides: Determinants and training needs. Int Arch Occup Environ Health 2012;85:57-66. Gaber S, Abdel-Latif SH. Effect of education and health locus of control on safe use of pesticides: A cross sectional random study. J Occup Med Toxicol 2012;7:3. Mnif W, Hassine AIH, Bouaziz A, Bartegi A, Thomas O, Roig B. Effect of endocrine disruptor pesticides: A review. Int J Environ Res Public Health 2011;8:2265-303. Dasgupta S, Meisner C, Wheeler D, Xuyen K, Lam NT. Pesticide poisoning of farm workers–implications of blood test results from Vietnam. Int J Hyg Environ Health 2007;210:121-32. Salameh PR, Baldi I, Brochard P, Abi Saleh B. Pesticides in Lebanon: A knowledge, attitude, and practice study. Environ Res 2004;94:1-6. Horrigan L, Lawrence RS, Walker P. How sustainable agriculture can address the environmental and human health harms of industrial agriculture. EnvironHealth Perspect 2002;110:445-6. Eddleston M, Karalliedde L, Buckley N, Fernando R, Hutchinson G, Isbister G, et al. Pesticide poisoning in the developing world--a minimum pesticides list. Lancet 2002;360:1163-7. Eddleston M, Phillips MR. Self poisoning with pesticides. BMJ 2004;328:42-4. Aghilinejad M, Farshad A, Naghavi M, Haghani H. Assessment of the relationship between pesticide and theireffects on farmerhealth in various state. Iran Occup Health 2006;3:81-5. Hosseini M, Ramazani A, Hanafie Bojd M, Hamidi H, Samimi K, Mohsenzadeh M, et al. Farmers' knowledge of occupational poisonings in South Khorasan, 2009. Iranian Journal 2011;18:47-54. Hosseini M, Ramazani A, Tavasolian H, Mohsenzadeh M, Maleki S, Samimi K. Survey of knowledge and attitude of farmers of Southern Khorasan province regarding agriculture related OHS issues in 2008. Iran Occup Health J 2011;8:24-9. Tucker M, Napier TL. Determinants of perceived agricultural chemical risk in three watersheds in the Midwestern United States. J Rural Stud 2001;17:219-33. Atreya K. Pesticide use knowledge and practices: A gender differences in Nepal. Environ Res 2007;104:305-11. Mohanty MK, Behera BK, Jena SK, Srikanth S, Mogane C, Samal S, et al. Knowledge attitude and practice of pesticide use among agricultural workers in Puducherry, South India. JForensic Leg Med 2013;20:1028-31. Esechie JO, Ibitayo OO. Pesticide use and related health problems among greenhouse workers in Batinah Coastal Region of Oman. J Forensic Leg Med 2011;18:198-203. Colémont A, Van den Broucke S. Measuring determinants of occupational health related behavior in flemish farmers: An application of the Theory of Planned Behavior. J Safety Res 2008;39:55-64. Boonyakawee P, Taneepanichskul S, Chapman RS. Effects of an intervention to reduce insecticide exposure on insecticide-related knowledge and attitude: A quasi-experimental study in Shogun orange farmers in Krabi Province, Thailand. Risk Manag Healthc Policy 2013;6:33-41. Hurtig AK, San Sebastian M, Soto A, Shingre A, Zambrano D, Guerrero W. Pesticide use among farmers in the Amazon basin of Ecuador. Arch Environ Health 2003;58:223-8. Mekonnen Y, Agonafir T. Pesticide sprayers' knowledge, attitude and practice of pesticide use on agricultural farms of Ethiopia. Occup Med (Lond) 2002;52:311-5. Samuel N, Apiakise E, Akpe B, Obele R. Knowledge, attitude and practices of small scale farmers on pesticide handling in Bayelsa State. Point J Med Med Res 2015;1:59. Zyoud SH, Sawalha AF, Sweileh WM, Awang R, Al-Khalil SI, Al-Jabi SW, et al. Knowledge and practices of pesticide use among farm workers in the West Bank, Palestine: Safety implications. Environ Health Prev Med 2010;15:252-61. Avory G, Coggon D. Determinants of safe behaviour in farmers when working with pesticides. Occup Med 1994;44:236-8. Konradsen F, van der Hoek W, Cole DC, Hutchinson G, Daisley H, Singh S, et al. Reducing acute poisoning in developing countries-options for restricting the availability of pesticides. Toxicology 2003;192:249-61. Recena MCP, Caldas ED, Pires DX, Pontes ERJ. Pesticides exposure in Culturama, Brazil-knowledge, attitudes, and practices. Environ Res 2006;102:230-6. Kamel F, Engel LS, Gladen BC, Hoppin JA, Alavanja MC, Sandler DP. Neurologic symptoms in licensed private pesticide applicators in the agricultural health study. Environ Health Perspect 2005;113:877-82. Gomes J, Lloyd O, Revitt MD, Basha M. Morbidity among farm workers in a desert country in relation to long-term exposure to pesticides. Scand J Work Environ Health 1998;24:213-9. Yassin M, Mourad TA, Safi J. Knowledge, attitude, practice, and toxicity symptoms associated with pesticide use among farm workers in the Gaza Strip. Occup Environ Med 2002;59:387-93. Norkaew S, Siriwong W, Siripattanakul S, Robson M. Knowledge, attitude, and practice (KAP) of using personal protective equipment (PPE) for chilli-growing farmers in Huarua sub-district, Mueang district, Ubonrachathani province, Thailand. J Health Res 2010;24:93-100. Derafshi M, Black C, Agnew R. Pesticide knowledge, attitudes, and clothing practices of Turkish farmers. Environ Management Sustainable Develop2017;6:149-67.